Tetralogy of Fallot NCLEX review for nursing students! In this review you will learn about the congenital heart defect known as tetralogy of fallot (TOF). This is a topic you will see on your pediatric nursing lecture exams and possibly the NCLEX exam. After reviewing these notes don’t forget to take the quiz that contains tetralogy of fallot NCLEX questions and to watch the lecture. What is Tetralogy of Fallot? It’s a congenital heart defect that is characterized by FOUR structural defects of the heart. It’s the most common complex congenital heart defect. It occurs when the baby is developing in the womb. According to the CDC.gov, 1 in 2518 babies born in the US will have TOF. It’s a cyanotic heart defect. 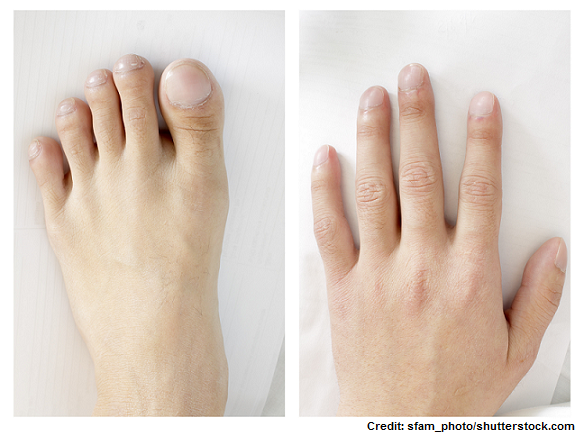 This means the patient will have cyanosis due to a decrease in pulmonary blood flow. When studying pediatric congenital heart defects, always let the name of the defect help you. With TOF, that are FOUR structural problems that you need to commit to memory. The word tetra or tetrad (tetralogy) means it’s a condition that consists of FOUR problems. 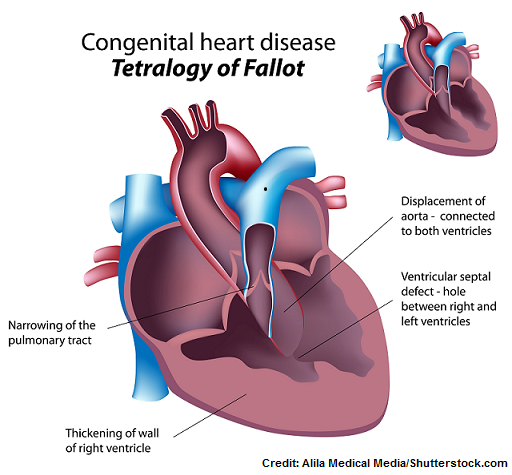 What are the heart defects in tetralogy of fallot? To understand tetralogy of fallot, let’s talk about NORMAL blood flow because then the defects make complete sense. But we have a problem at this point and it’s called a VENTRICULAR SEPTAL DEFECT (VSD). This is a fancy word that means there is a hole in the ventricular wall. Normally this wall separates the RIGHT and LEFT ventricle, but in TOF the blood is mixing….this is a problem because we will have exhausted, unoxygenated blood mixing with fresh oxygenated blood. Unfortunately, the problem doesn’t stop here. The blood that is in the right ventricle has a strong desire to reach the lungs to get oxygenated. To do this, it must go up through the pulmonic valve and pulmonary artery. In TOF, there is NARROWING of the pulmonary valve and artery (proper term STENOSIS). Therefore, blood can NOT easily go up through the pulmonary artery to go to the lungs to get oxygenated. Now depending on the severity of the stenosis or obstruction (if very severe), it will cause a right to left shunt of blood which causes even more unoxygenated blood to enter back into the system. SO, THE RIGHT VENTRICLE HAS TO WORK HARDER (when you overwork a muscle it enlarges). Therefore, right ventricle hypertrophy occurs (another way of saying enlargement of the right ventricle), which can lead to heart failure in the long run. Then on the left side of the heart, the aortic valve is enlarged and this causes the aorta to be displaced. Normally, the aortic valve just connects to the left ventricle, but now it is actually connecting to the septal defect and is collecting all the blood that is mixing at the ventricular septal defect. This will cause poorly oxygenated blood to go throughout the body. Lift knees-to-chest position or squatting (children) WHY? squatting and the knee-to-chest position increases systemic vascular resistance, which will decrease the right to left shunting in the ventricles and helps increase oxygen levels. This heart defect will require surgery, which can be temporary (a.k.a. palliative) or complete repair. Temporary surgery is performed to help with cyanosis and improve blood flow. It can include shunt placement to shunt oxygenated blood through the heart so oxygen levels are increased or stent placement to open up the stenosis. In addition, complete repair can be performed when the child is older enough to tolerate surgery (about 6-12 months of age). This includes placing a patch over the septal wall defect to prevent blood mixing in the ventricles. If a child has a severe case of TOF, where there is a severe defect to the pulmonary valve (blood won’t be able to get to the lungs) and the newborn is very cyanotic at birth, a temporary surgery may be performed and a prostaglandin infusion started. Aprostadil (prostaglandin E) will keep the ductus arteriosus open (this normally closes shortly after birth) to allow more blood to flow to the lungs for oxygenation.